Today is officially Fall but you won’t know that in blazing hot Los Angeles. So I am making one last easy summer salad before I begin thinking about soups or casseroles. 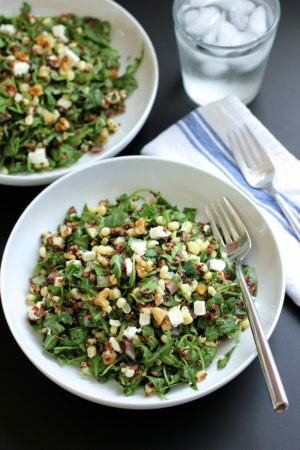 This quinoa salad with corn, feta and walnuts is a fresh, healthy salad. 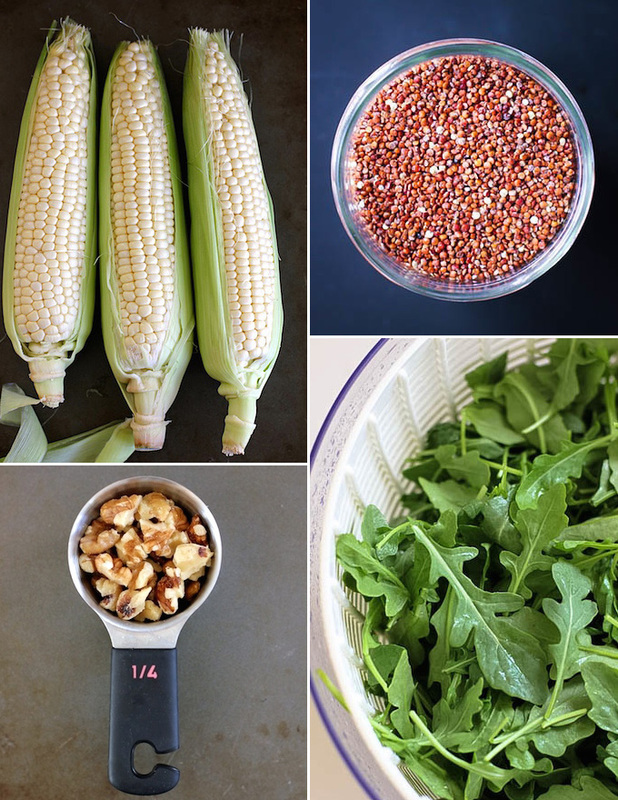 The corn is sautéed with a little garlic to bring out it’s sweetness, then tossed with peppery arugula, red quinoa, salty feta and crunchy walnuts. Add a simple white wine vinaigrette and you’re done. As mentioned in one of my previous recipes, I’ve been keeping cooked quinoa in the fridge to add to meals throughout the week. This is a great time saving technique to add some protein to a salad or a wrap or some soup. Just add some of the quinoa to whatever you’re making. If you have cooked quinoa on hand you can put this salad together in 15 minutes. All the flavors in this salad worked really well together – this is the kind of salad I could eat all week and not get bored with. Hopefully, the weather here will change soon so I can start thinking about fall recipes but for now this salad is the way to go – an easy, healthy salad using the last of summer’s sweet corn. A flavorful summer salad featuring sweet corn, quinoa, peppery arugula, salty feta and crunchy walnuts. 1 1/2 cups cooked quinoa (1/2 cup of uncooked quinoa will equal 1 1/2 cups cooked quinoa). I used red quinoa. Cook quinoa as per package instructions. Let cool slightly when done. Cut corn from the cobs with a sharp small knife. In a saute pan, heat 1/2 tbs oil, add corn kernels and minced garlic. Saute for 2 minutes over medium heat – stirring occasionally so corn does not burn. Let cool and prep other ingredients. Roughly chop the arugula and add to a bowl. Add diced feta, walnuts and diced red onion to the bowl. Add corn and quinoa to bowl. Make dressing by whisking all ingredients together and toss over salad. To cut corn from cob, place corn cob in a bowl and strip kernels off with a downward motion using a small sharp knife. I find a small knife easier to handle vs a large chef knife. Cut down and away from your self so you can’t cut your self accidentally. You want to let the quinoa cool slightly when it’s done. A quick way to cool it down is to spread it out on a baking sheet. Thanks, Izzy. I’m with you on a good quinoa salad – definitely my lunch go to. Love the look of this salad!! I agree, having cooked quinoa in the fridge is a major time saver!! Thanks, Cathleen – the cooked quinoa is a definitely a real time saver! This sounds so good; I bet the feta and sweetcorn are really good together. Would make a great lunch to take to work! Thanks – the salty feta and sweet corn do work really well together! Geraldine, this salad creation is wonderful! 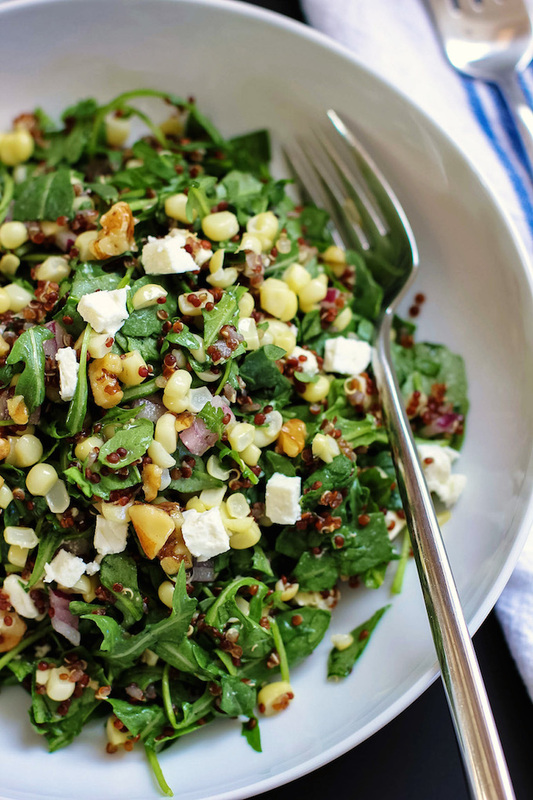 Fresh corn, quinoa, walnuts and feta cheese – what more does a girl need? Thank for sharing this lovely recipe! Mmmmm…..fresh corn in a salad! This is my kind of a salad! Love that this salad is heavy on the veggies and light on the quinoa! Makes it so I can eat that much more of it. Thanks so much, Dani. Definitely packed with veggies! One of my favorite things about Summer is corn, right off the cob. No cooking! It’s so sweet and has pop of texture that I adore. I love your salads! You’re so creative and have the perfect balance of ingredients! I think keeping quinoa in the fridge is such a great idea… one I need to incorporate! So smart! No doubt it’s too hot for you to start getting into Fall mode! I hope it cools for you soon! Can’t wait to see what you’re up to in the kitchen for Fall! Thanks, Traci. I’ve been thinking about fall recipes – especially soups – but it’s just too hot to actually act on the impulse. Hopefully, only a couple more weeks of this hot weather. Seems like fall weather is coming later and later each year in Los Angeles.